You can buy 2 oz Silver Yin Yang Rounds new exclusively at Kitco. Designed with a gorgeous interpretation of the Yin Yang, this two piece pure silver round is a truly exclusive silver bullion item. It is a terrific silver present or silver gift, and is also a very unique way to hold silver bullion. This two piece 50 mm diameter pure silver round is larger than standard silver bullion coins, and comes in a single capsule. Shipped with a small velvet gift bag in a cheerful red color which represents luck and good fortune in Chinese culture. 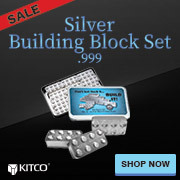 The Kitco 2 oz Silver Yin Yang Rounds are also .999 pure silver bullion. Each 2 piece silver bullion item contains 2.016 oz of .999 fine silver bullion. The yin yang's capsule can be opened to reveal the two separate silver pieces, demonstrating the two complementary but contrary forces of the yin and yang silver bullion round. To confirm authenticity, both sides are engraved with the purity, fine silver bullion metal content, and mint stamp. The 2 oz Yin Yang Silver Rounds are minted in pure silver bullion by the Sunshine Mint (SMI) headquartered in the USA, exclusively for Kitco Metals. Wondering what to buy someone for a unique gift? This 2 oz, 99.9% pure silver yin yang round is a truly unique present. The yin yang concept of finding balance and harmony in life is something that all wise friends and loved ones will understand. The beauty, longterm value, and permanence of pure silver bullion, is something many silver gift recipients will love and cherish. These Yin Yang 2 oz Silver Rounds have been minted in limited quantities. Buy Kitco 2 oz Silver Yin Yang Rounds new and exclusively here at Kitco. Why buy Yin Yang 2 oz Silver Rounds from Kitco?